The Bermuda Economic Development Corporation [BEDC] recently sponsored a class of 22 budding, young entrepreneurs from The Berkeley Institute to take part in Virtual Enterprises International’s Global Youth Business Summit 2018, which was held in New York City from Monday, April 16th to Wednesday, April 18th. Since September, the students have been undertaking a Virtual Enterprises International [VEI] programme, whereby they are given an opportunity to create and run business ventures in the confines of their classroom. With the help of Berkeley Institute teacher, Ms. Dawn Nichols-Marshall, the local teens formed ‘Vacations in Paradise Enterprises’, a virtual company offering tourists vacation bundle packages in Bermuda. They have spent the past few months replicating all the functions of a real business – from product development, production and distribution to marketing, sales, human resources, accounting/ finance and web design. Earlier this month, thanks to the students’ own fundraising efforts and an additional $7,000 boost from the BEDC, the young people joined with more than 150 schools from 10 countries from around the world for the Global Youth Business Summit 2018. Attended by more than 4,300 people, the summit brought together rising young professionals and aspiring entrepreneurs for a one of a kind global convention. Participants were exposed to a week of dynamic business competitions, leadership events and professional networking opportunities. The excitement started on the morning of Monday, April 16th, with the preliminary round of the National Business Plan Competition; followed by a series of other contests, as well as an International Trade Exhibition. The aim was for students to display the professional skills and business acumen they developed while running their Virtual Enterprise companies during the school year. 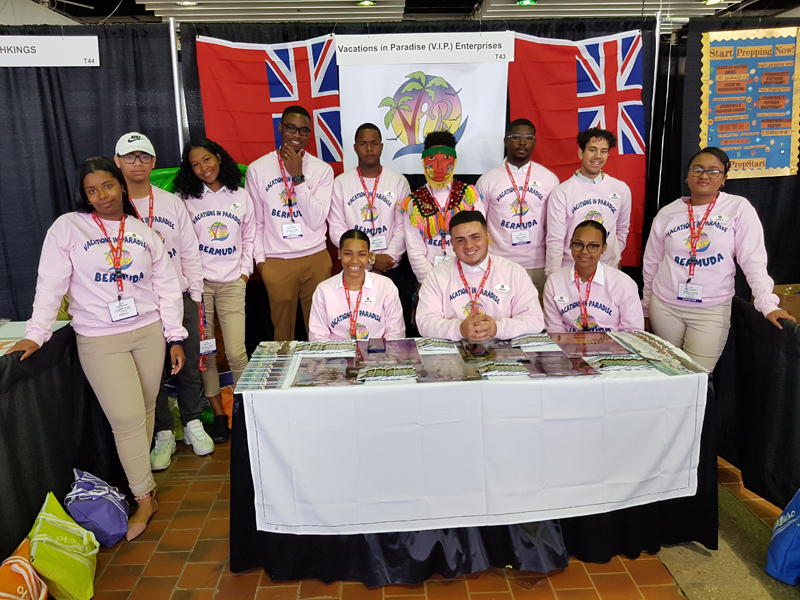 The Bermuda team set an overall goal of raising $15,000, which went towards the students’ presentation and materials for a marketing booth at the conference, as well as flights, lodging, meals, transportation and other miscellaneous costs. Mrs. Erica Smith, the Executive Director of the BEDC, said: “It was our pleasure to partner with The Berkeley Institute to provide these 22 local students with an enriching and rewarding experience at the Youth Business Summit 2018. BEDC’s mission is to inspire, inform, support and grow new and existing Bermuda businesses and I am confident the skills developed by students to create their virtual business will be able to transfer well should they ever decide to create their own real-life businesses in the future. Berkeley student Tyrese Coakley, the Chief Executive Officer of the virtual business venture, said: “Experience is the best way to learn. That’s why Berkeley Institute implemented a class called VEI. The class is aimed at helping students discover the value of working responsibly and allowing them to gain valued experience in real world business endeavours. With an emphasis on college and career readiness, VEI is an in-school, live, global business simulation that offers students a competitive edge through project-based, collaborative learning and the development of 21st Century skills in entrepreneurship, global business, problem-solving, communications, personal finance and technology. Ms. Nichols-Marshall stated that the VEI course began in 2016 and continued into this year with a different cohort of students, between ages 16 and 17. ‘Vacations in Paradise’ is a business idea that they have continued from the last school year. Ms. Nichols-Marshall admits she has seen a shift in the students’ thinking over the last school year. They can now identify their passions and many of them know exactly what they want to study after completing high school. They have learned to think outside the box, undertake tasks with little or no consultation, and are more results-oriented and focus-driven. “For our students, the recent opportunity to travel to the Global Youth Business Summit 2018 meant that they could establish a more robust college/university preparation through open discussion, networking and informal mentoring,” Ms, Nichols-Marshall said. Mrs. Jamillah Lodge, BEDC’s Acting Micro, Small and Medium Enterprise Director, stated, “We are excited to hear that our local students fared well in this event alongside hundreds of other teams from around the world. For more information on the BEDC, call 292-5570 or email info@bedc.bm. To learn more about upcoming events offered by the Youth Business Summit, visit here.